Malone University is pleased to announce the four new exhibits in its campus art galleries through February 22. An artist reception will be held on Friday, February 8 from 6-7:30 p.m. in the Johnson Center for Worship & Fine Arts. Visitors are welcome to tour the galleries on campus at 2600 Cleveland Avenue NW. Much of the art is available for purchase. For more details, please visit www.malone.edu/art. Featuring ceramics by Travis Helmkamp. 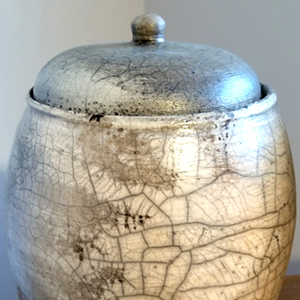 Travis Helmkamp is a Canton, Ohio ceramicist specializing in Raku and stoneware pottery. All of his pieces are one-of-a-kind. Brief Bio: David Staton attended Shorter College in Rome, Georgia and received a diploma from the Corcoran School of Art in Washington D.C. He has had solo exhibitions of his work in Washington DC and Germany and has been featured in group exhibitions in Washington D.C., Virginia, and Wisconsin. His work is included in many collections, including The Corcoran Gallery of Art in Washington D.C., and The Madison Art Center and Whistler Art Center, both in Wisconsin. Staton has been living in Canton for four years with his family. His wife, Patricia and daughter Jane are both Malone University graduates. Artist Statement: I like to work from living things in my life. I had painted heads for some time modelled after Roy Lichtenstein’s work as well as being a kind of dialogue with the late German artist, Georg Ettl. I was waiting for another subject to occupy me. One day, my daughter brought home two cats from the animal shelter. I caught a glimpse of one as it ran by a few days later. 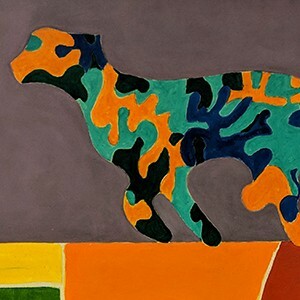 I had painted running cats before but they now reappeared, the first one being “Glimpse.” Eventually, I not only painted cats, but I worked on dogs in many different settings. Backgrounds and negative space are very important in my work. One can see the influence of the Washington Color School in my paintings, as well as my lifelong interest in Henri Matisse’s work. I use stylized versions of the animals by implementing stencils, cutouts and using various projectors. The Scotties find their source back in earlier paintings which show this but have progressed beyond to drawings and tracings of cement figures. Whatever I happen to be painting, working consistently every day helps my body of work to grow and branch out. Brief Bio: Heather Bullach is a portrait and landscape artist. Working primarily in oils, her style ranges from tight realism to expressive impressionism. She earned a bachelor's degree in Art from Malone University. 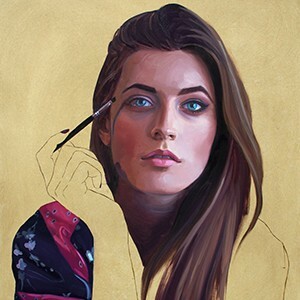 Her award-winning work is widely exhibited around Northeast Ohio, including three solo exhibitions. She teaches painting at Malone and lives in Dalton. Artist Statement: I am captivated by light: The way it shifts, creates colors, evokes moods and emotions; the way it changes with the time of day, with the weather, and with the season. I love capturing these nuances whether they are playing across a face and figure or in the landscapes around my Northeast Ohio home. Portraits are my first love. I aim to catch a beauty that goes beyond the physical: to show the spirit of those I paint. Little gives me as much joy as watching someone come to life on my canvas. I recently found a love for landscapes as well. In them I also work to capture a feeling and energy of the time and place that extends beyond the physical elements. My background has been to strive towards photo-realism. In recent years, I’ve found a joy in painting more freely, leaving my brush strokes, and letting the paint be paint. I find myself dancing between these two approaches and am thrilled when a piece finds that perfect marriage of the two: the accuracy of a photograph, with the life and expressivity of pure paint. Brief Bio: Robert Crombie of Chagrin Falls attended Cooper School of Art with teacher Pete Olmar, who was a curator at MoMA in New York City for 29 years. Crombie has sold hundreds of paintings in the past 15 years. Greatly influenced by the work of Vincent Van Gogh and Monet, Crombie has visited Provence nearly a dozen times, and texture, composition, punchy color, and nature can be found in each of Crombie's paintings. Artist Statement: This exhibition is a collection of my work over the past few years. 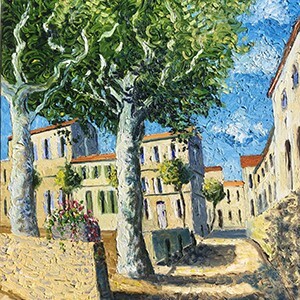 I began painting plein air in Provence in 2005. Eleven trips total. There is still nothing there that I take for granted. I love it all. The blue skies, warmth, the kindness of the residents, and my freedom to paint where I wish. When I was 18, I began a painting class at Cooper School of Art. Huge canvases, acrylic paint, and large brushes. They were abstracts, 36” x 48” and much larger. My painting teacher loved my work while I loved everyone else’s work. I finally found a way to say what was going on inside me. After art school, life and career took first place and all else went to the wayside. I stopped painting for 30 years. Sixteen years ago I came back to painting but this time with oils, and I was more interested in landscapes and village scenes. The more organic the better. 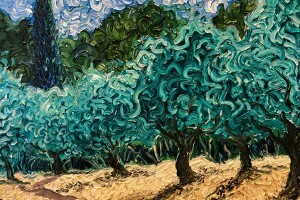 I love the workability of the oils. The colors and consistency. All of these paintings on display show my love for trees, nature, France, Provence, art, and the gift I was given to be able to do all of these. It is a wonderful opportunity to exhibit all of these pieces and to see them all together. My hope is that my appreciation for Provence comes through and sparks your interest in the south of France as well as my work.